POLL: Should states remove Confederate monuments? As a descendant of Civil War soldiers who wore both the blue and the gray, a Kentucky mayor said he's taking his own stand — marshalling support to remove two Confederate statutes from prominent spots in his city. Violence that erupted over the weekend at a white nationalist rally in Charlottesville, Va., added momentum to a wave of efforts across the South to remove or relocate Confederate monuments. Lexington, Ky., Mayor Jim Gray moved up his announcement in reaction to the bloodshed, which saw a vehicle plow into a group of counterprotesters, killing one woman. The memorials to John C. Breckinridge and John Hunt Morgan are perched outside a former courthouse that was the site of slave auctions before the Civil War. "It's just not right that we would continue to honor these Confederate men who fought to preserve slavery on the same ground as men, women and even children were once sold into a life of slavery," Gray said in a YouTube video Sunday. "Relocating these statues and explaining them is the right thing to do." Removing Confederate monuments is complicated in Tennessee, where lawmakers enacted a law last year that made any push to remove historical markers harder. 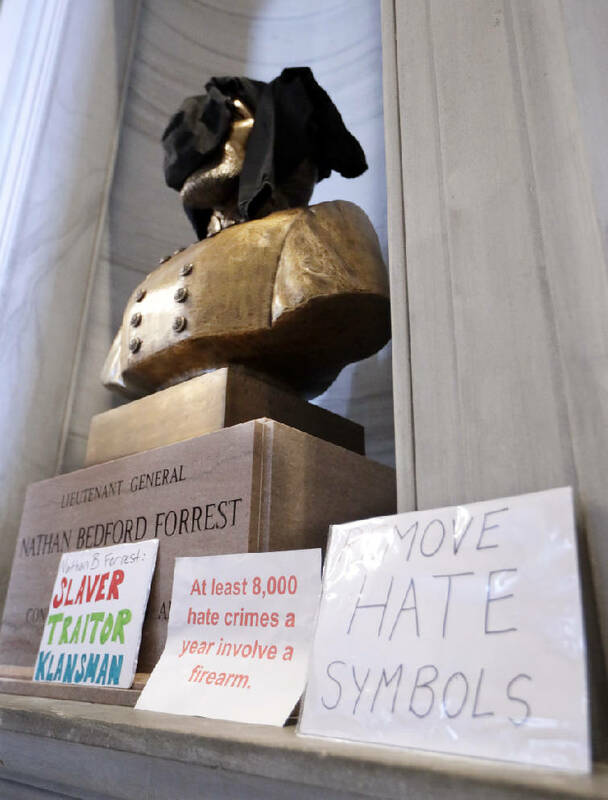 That didn't stop dozens of protesters from gathering in the Tennessee Capitol in Nashville on Monday to renew calls to remove a bust of Nathan Bedford Forrest, a Confederate cavalry general and an early leader of the Ku Klux Klan. Protesters draped a black jacket over the head of the bust while cheering, "Tear it down!" Republican Gov. Bill Haslam later said he didn't think Forrest should be honored at the Capitol. State lawmakers responded to a previous push to remove the bust in the aftermath of the slaying of nine black churchgoers in South Carolina by passing the "Tennessee Heritage Protection Act." The 2016 law requires that two-thirds of Tennessee Historical Commission members agree to change or remove historical markers, up from a simple majority. In Memphis, city attorney Bruce McMullen said Monday he plans to file a petition to remove a statue of Forrest from a park. The Memphis City Council voted in 2015 to relocate the statue, but the state historical commission blocked the move under the Heritage Protection Act. 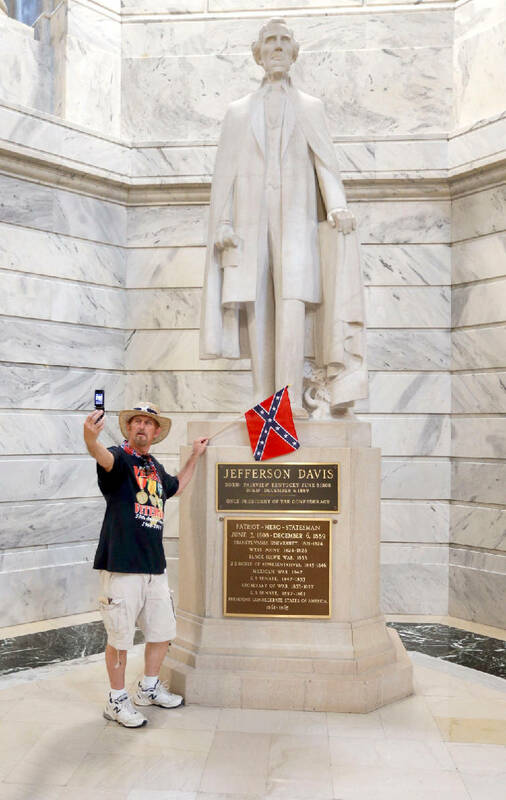 The statue is located at a park where the Sons of Confederate Veterans celebrate Forrest's birthday each year, with men and women dressed in Civil War-era garb and waving Confederate flags. The remains of Forrest and his wife are buried under the statue. The city has said it wants to move the remains to a cemetery. The violence in Charlottesville has spurred debates and action on the fate of Confederate memorials elsewhere across the South. In Florida, sounds of a jackhammer echoed in downtown Gainesville as workers tore out the foundation of a Confederate statue known as "Old Joe" in front of the Alachua County Administration Building, The Gainesville Sun reported Monday. The monument will be returned to a chapter of the United Daughters of the Confederacy — the same group that erected it in 1904. Baltimore Mayor Catherine Pugh said she has contacted two contractors about removing that city's Confederate monuments. In Louisville, Ky., a statue of a Confederate officer was splattered with orange paint. Police said no suspects have been identified. Louisville Mayor Greg Fischer announced Monday that a panel will review the city's public art and make a list of places linked to bigotry, racism or slavery.